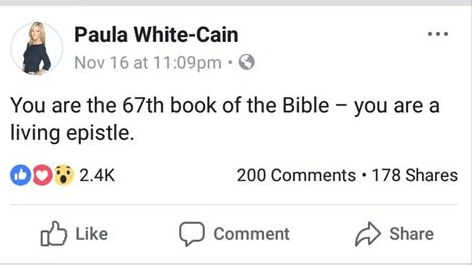 There’s no reason a Continuationist wouldn’t believe Paula White’s tweet to be at least credible. Continuationism – the doctrine that undergrids all charismaticism, holds that God is still delivering divine revelation. Although Third Wave charismatics – like John Piper and Wayne Grudem – argue that modern prophecy is not Scripture-level authoritative, it’s a suggestion that is Scripturally untenable. God doesn’t speak both fallibly and infallibility, and the infallible communication of prophecy has always been a benchmark of its divine authenticity (Deuteronomy 18:15-22). Paula White, the former mistress of Benny Hinn who is currently in her third marriage with Journey musician, Jonathan Cain, also made the Pulpit & Pen presses two weeks ago for announcing that God was hungry and asking how she might feed him. A few days ago she dropped another steaming defecatious pile of doctrinal waste, telling her followers that they each are their own 67th Book of the Bible. The Holy Scriptures are “inspired,” which is often translated God-breathed (in Greek, it is θεόπνευστος). In reality, the context is that the Scriptures are “breathed-out” by God, rather than what is commonly communicated as “breathed-in.” To make it a fuller, more exhaustive idea, the Scriptures are breathed out by God and breathed into men by God, producing the Scripture. For something to be the Holy Bible it must literally have been produced from God’s own infallible heart and infallibly conveyed by men in written form. If our lives are the 67th Book of the Bible, what a fallible book that would be! Paula White’s would be an epistle written by an unvirtuous, immodest, serial-divorcee who fleeces the poor in exchange for filthy lucre and validates the supposed salvation of infamous unrepentant sinners. The Bible has been written, and although Revelation 22:18-19 is often said to pertain only to the Revelation of Jesus Christ to John the Disciple, there is little doubt that the last-living Apostle knew that his words would be inscripturated and be the last epistle added to the canon (and if not, the Holy Spirit who inspired those words did know). God will take away Paula White’s share in the Tree of Life and Holy City, and God shall add to her the plagues written in the Book. Previous story Who is a Real Reformer? Meet William Farel.